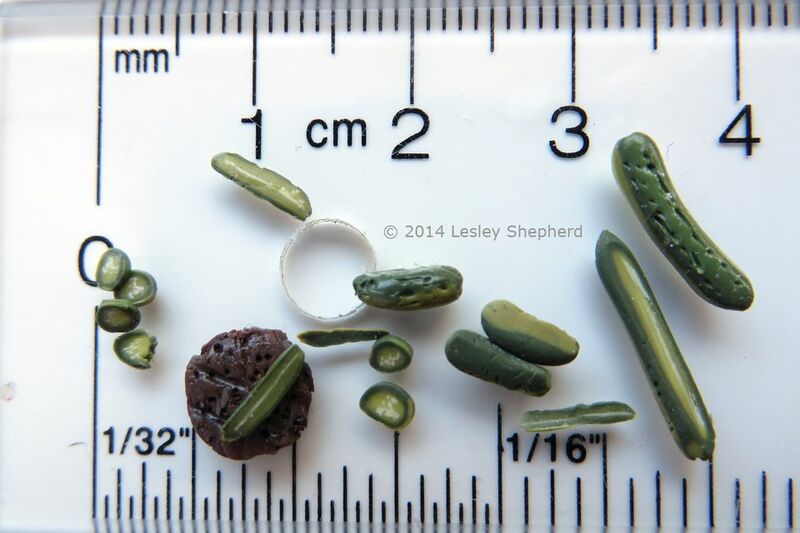 These dollhouse scale dill pickles are made from a polymer clay cane that can be adapted to make cucumbers or a range of sweet pickles in miniature scales. The cane is a fairly simple project to master, and the slices are realistically translucent when held up to the light if they are set into a jar. Here we've shown how the pickles can be used with a grilled hamburger patty. They can also be cut into tiny chunks, cured, then combined with acrylic glaze or tar gel medium to make relish for tiny hot dogs. If you are new to working with polymer clay, read the basics of polymer clay before you begin. Do not use food utensils to work with polymer clay. Keep it safely out of reach of children. Most of the work is in producing colors to match real pickles (or cucumbers). This gives beginners some good practice in custom blending polymer clay as well as simple caning techniques. For the best results, use the firmest polymer clay you feel comfortable working. Soft polymer clays tend to blend instead of keeping crisp separations as you cane them. Ours were a mix of soft and firm clays, and were too soft to get the level of definition we would have liked! The center seed layers should have been much more defined. Basic colors of polymer clay in translucent (porcelain), white, brown, green and yellow. See the information on blending dark green and dark brown polymer clay from primary colors. Acrylic Varnish or Gloss/Semi-Gloss Coating. The first step in making polymer clay pickles or cucumbers is to make the skin color which is the darkest color you will need. We combined equal amounts of dark green, dark brown, and zinc yellow to make a dark olive color as the base for miniature dill pickles. For regular cucumbers, you may only need dark green. We used small amounts (around 1/4 inch square) of the base colors in order to make dollhouse scale canes. As you will be adding translucent clay for the centers, you don't need to make a lot of the olive green base. You can make a range of lighter olive clays to mimic the semi-translucent shades of dill or sweet pickle centers. The photo on this page shows the basic dark olive green clay, which mixed one for one with translucent makes the lighter olive clay in the center. The olive clay we used for the centers of our dill pickles was mixed from the middle olive clay combined with an equal amount of translucent again to make the lighter clay on the bottom. To mimic a particular type of pickle (or cucumbers), you will need to adjust the basic colors of your translucent center clay. The small amounts of brown, yellow and white shown in the photo on this page were added to the basic light olive green to further adjust the color to match real pickles. As some clays darken when cured (baked) you may need to test a bit of your final blend to make sure it is the color you want, before you proceed to make your pickle or cucumber cane. To make custom blends add small amounts at first to see how your clay color develops. The first step in making the polymer clay centers of canes for cucumbers or cucumber based pickles is to make the 'seed' cane. To do this, mix a small amount of very light olive green (mainly translucent) clay. Roll out a thin sheet of white clay, and wrap it around the roll of green as shown in the photo. Trim the clay edges where they touch once they are wrapped entirely around the roll. If you are making cucumbers instead of pickles, you may want to make the seed cane from pure translucent clay instead of wrapped with white, the white edge of the seeds might blend too much into the white center of the cucumber. For the pickles, you need to have some type of contrast between the outline edge of the seed cane (here white) and the main body of the pickle or cucumber cane. See photos of pickles or cucumbers to see how the seeds look when the cucumber or pickle is sliced. Gently press the roll to join the white to the faint green clay, and begin to roll the clay into very thin rolls. You will need around 15 short thin (1 inch or 2.5 cm) rolls for a basic pickle or cucumber cane. Most (but not all) cucumbers and pickles have 3 distinct 'lobes' of seeds running through the center. To replicate that in miniature using polymer clay, we first lay out alternating strips of three to five fine rolls of 'seed' cane, with similarly sized rolls of the clay we will use for the central core of our pickle or cucumber. These strips are then gathered into a loose roll. On this page, the color is for a dill pickle as that makes it easier to see the process. The top of the photo shows a seed can (and a cross section of that cane before it is rolled thin, showing the pale translucent green center surrounded by white. The first section below the single fine roll is the grouping of alternating strips, and the other two groupings below are the alternating strip groups gathered into rolls, and separated with equal sized strips of the green pickle center color. You will need three rolls composed of alternating strips, separated by three similar sized rolls of green to hold the seeds into rough lobes in the center of the cane. To finish the center of the polymer clay cane for cucumbers or pickles, the three groups for the 'seeds of the pickles, separated by the three rolls of translucent green clay, are rolled loosely into a cane. (see photo). More of the translucent olive green clay (for dill pickles, for bread and butter pickles or cucumbers you might use off-white or white) is rolled out into a thin sheet which will be used to cover the seedy center of the pickle or cucumber cane center. This cane is assembled the same way the seed cane was assembled, by rolling the olive coating over the central core, trimming away the excess, and pressing down gently on the roll to set the cane. Do not thin this roll out, leave it as thick as possible for now. Set it aside to firm up while you prepare the pickle or cucumber skin. To make the outer skin for pickles, you will get the best effect if you add small thin stripes of clay to the background color you need for your cucumber or pickle cane. We used bits of yellow light green and olive green and laid them at random over a thin layer of the dark green we produced in step two. You want the stripes to run the length of the cane, rather than around it in rings. When you have added bits of color to your main layer, take a polymer clay roller and roll out the skin layer as thin as possible, gently blending in the strips of color you have just added so they are set level with the main green color. To finish the polymer clay cane for pickles or cucumbers wrap your dark green or blended 'skin' around your central core cane as shown. The cane cross section in the center of this photo shows a skin layer which should be thinner in comparison to the thickness of the core cane. You want the pickle (or cucumber) skin to be very thin, just wide enough to notice the color. In our pickles, the skin was too thick to roll out enough on the cane for a realistic effect. We should have made our core cane thicker to start with, or made our skin layer much thinner than you see in this photo. To make your polymer clay cane into pickles or cucumbers, roll the cane out on a flat surface to an even roll the thickness you want for your cucumber or pickle. We are making dill pickles with the canes in this tutorial, and want them to be roughly 1 inch in diameter in 1:12 scale, so roughly 1:12 inch (2mm) in diameter. Set the rolled canes aside to firm up in a cool area (fridge or freezer) before you attempt to slice them. Slice sections of the cane to the length you want for your pickles. gently roll the ends to round the 'skin' over the cut end of the cane. Bend the 'pickles' slightly and use a pointed modeling tool or pin to make lines of small indentations across the length of the pickle. Gently roll the pickle to blur the lines slightly. Sweet and dill pickles are often cut in cross section. Use a sharp clay blade to slice thin sections off a cold (and firm) clay cane. Draw the blade across the cane, rolling the cane as you cut slices so that the slices are not flattened on the bottom side. Form a pickle as for full dill pickles. Use a sharp clay blade to cut the pickle lengthwise to make long dill pickle slices. If you wish you can use the side of a fine pin to make gentle indentations across the surface of cross-cut slices to emulate 'crinkle cut' pickles. Place your pickles or pickle sections on a thin layer of baking soda set onto a baking surface or baking tray. Bake according to your clay's directions. When your clay has baked, allow it to cool. Remove the pickles (or cucumbers) from your tray and carefully wash off the baking soda. Allow the pickles to dry, then glaze with a thin gloss coating of acrylic varnish, floor polish, or gloss coating. Drips of the coating can be colored slightly to look like pickling vinegar if you wish. Cucumbers can be polished gently on the outside with a bit of furniture wax or clear shoe wax, they do not need a gloss coating. Allow to dry. Vary the coloring of your pickles and add them to jars, food trays or make chopped relishes for your miniature displays.